Most of you probably have outdoor lighting around your homes, either to accentuate certain features or provide additional security. Many of these same characteristics can be brought to your RV as well. Several types of outdoor lighting from Mr. Beams also give you the benefits of LEDs, including longer lifespans and more efficient energy consumption. These different styles of outdoor lighting fixtures can work together to provide your space with ample illumination. 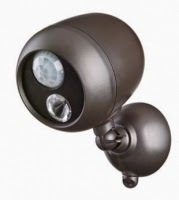 The MB360 is a security spotlight that works on battery power, saving you from having a complicated wiring set-up. This also gives you the ability to mount it nearly anywhere. 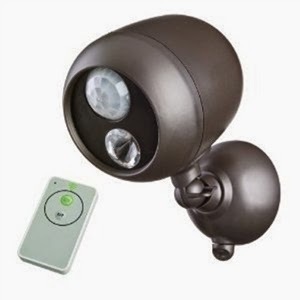 Working much like the security lighting you would have at home, it uses a motion sensor to detect movement up to 30 feet away. It conserves power by shutting off after 30 seconds and will not activate during the day, thanks to the light sensor. The direction of the beam can be easily adjusted through the use of thumbscrews, allowing you to point the beam where you want it to go. Its durability allows the light to be used in all kinds of weather. 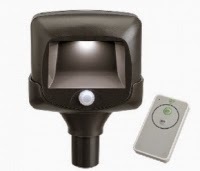 On a similar note, the MB371A can be used as a security light as well, but also features remote control operation. This works well, if for a certain reason, you need the light shut off at night. As with the MB360, it also works solely on battery power. Other similar features include motion sensing up to 30 feet and the ability to point the beam in a specific direction, such as towards your RV entrance. The MB542 pathway lights come in a set of 2, so you can easily bring balanced illumination to an entrance or foot path. One unique aspect of these lights is that the light sensor activates them when darkness falls, but will glow brighter when motion is detected. This not only provides general ambient lighting, but also gives additional illumination right when you need it. To make things even easier, it also comes with remote control so you can activate the lights before someone walks by. These examples of outdoor lighting options can be used to brighten pathways, entries or even campsites. There's no need to have you or someone in your group risk stumbling in the dark because the area is not bright enough to see. As with many other things, you can bring the same nighttime atmosphere to your RV or campsite that you would at home. Any of these lights can be used for multiple purposes, allowing you to apply them as you see fit.